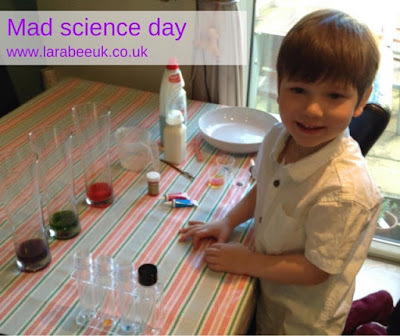 Last week I had to swap one of T's nursery days as I had to work on Friday, unfortunately I had to swap his jeans for genes science day which meant that he missed out on the experiments he was so looking forward to. 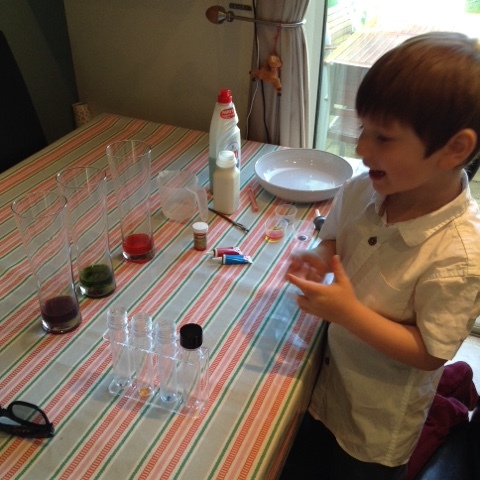 Spurred on even more after watching an alvin and the chipmunk episode wherethey conduct experiments he asked for a 'mad science day'. As I'd changed his plans due to my job, I couldn't resist. 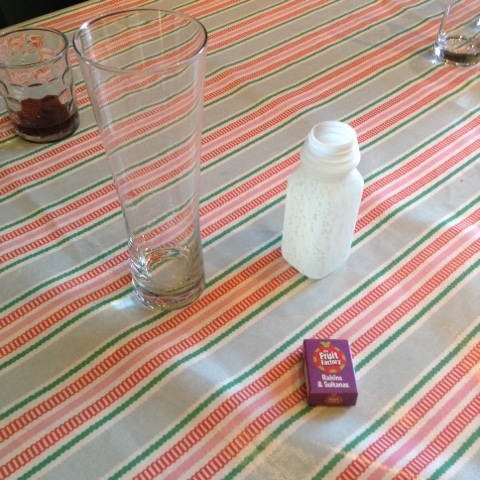 I came up with a few simple 'experiments' as we had made bicarbonate of soda eruptions at our valentines play date I avoided anything with bicarb. WARNING! This post is photo heavy! 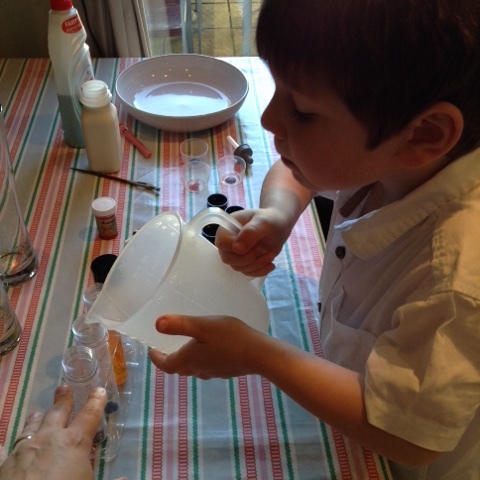 First T insisted on putting on his 'science coat' which a basically a white shirt which is a little too big! He also found his 3D cinema glasses in his dressing up box and put them on. 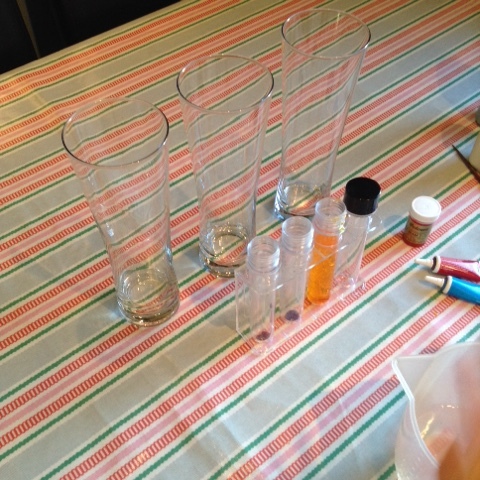 I set everything out on the table for 4 experiments. 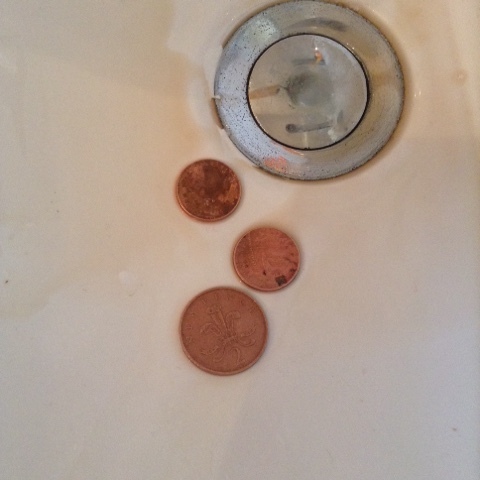 First we used Cola to clean some copper coins. 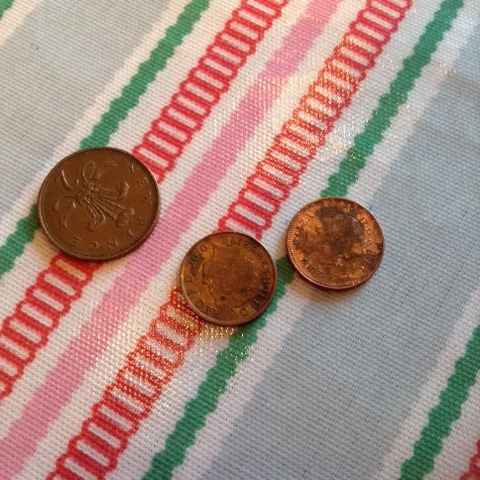 I set out the 3 things T would need for this experiment and asked T what he thought we were doing. 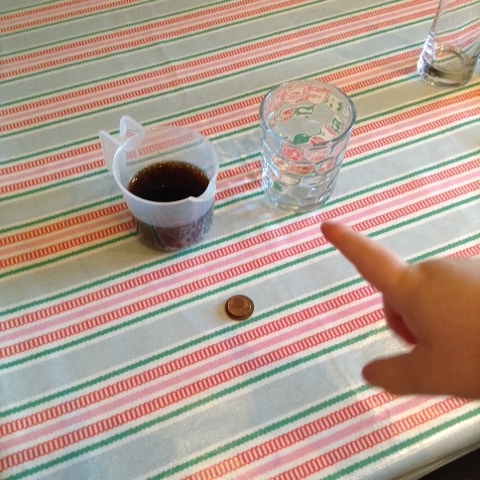 We talked about how dirty the coins were and how clean we thought they'd get after being soaked in the cola. 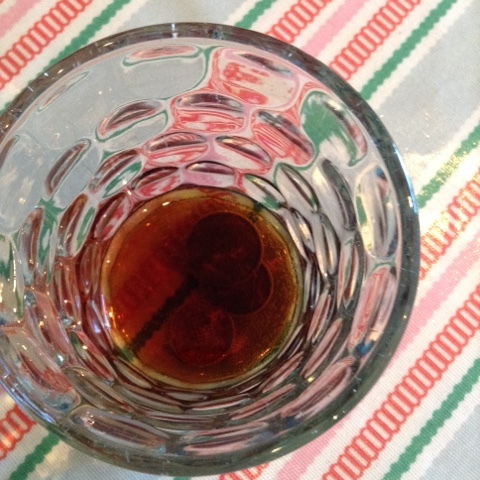 T poured the cola into the glass and dropped in the coins. We set the timer to check them in 4 hours. When we checked on them, they were so much cleaner. Our second experiment was the dancing raisin experiment. 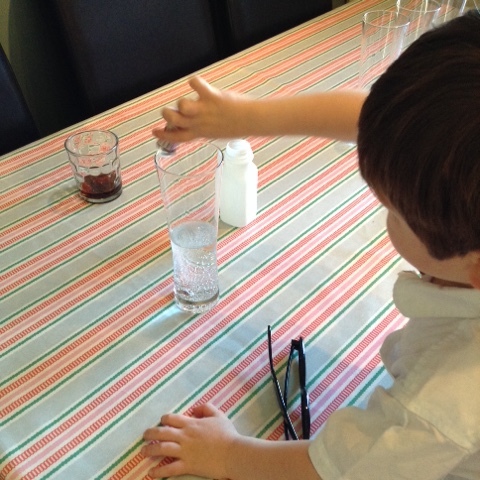 T poured in the lemonade and then added the raisins. We watched them dance up and down and talked about why the raisins were lifting up and then going down, T correctly identified the cause as the bubbles making them rise and when they pop the raisins falling, I was really proud he actually lptook the time to observe long enough to understand what was happening. 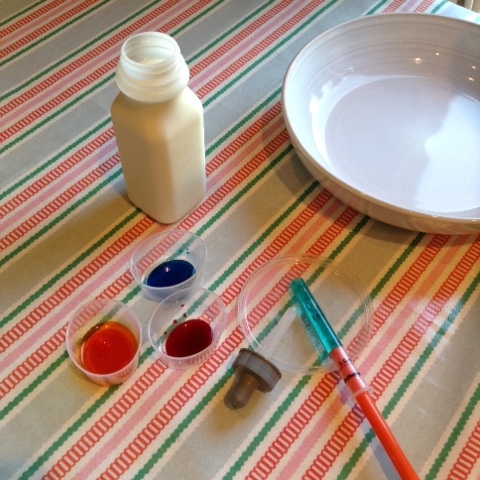 Our next experiment was colour mixing, we first mixed food colouring in some old plastic test tubes I had sprinkles in. We mixed red, blue and yellow. 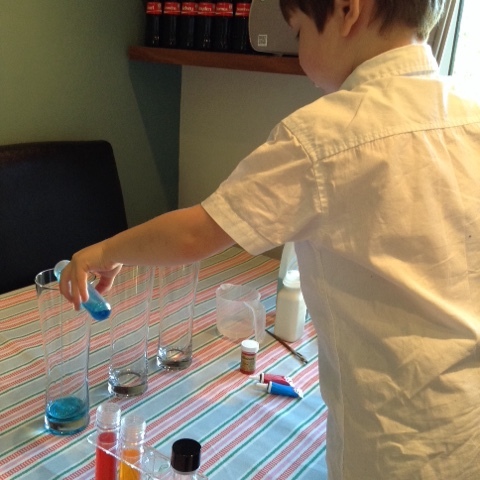 T then mixed the colours in the large glasses red and blue, red and yellow and blue and yellow. 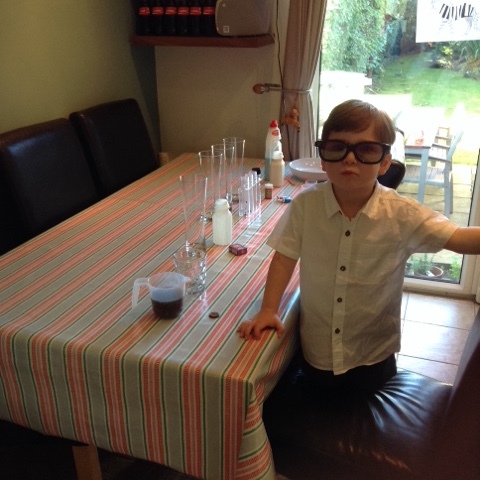 T couldn't resist swirling round the glasses like a real scientist! 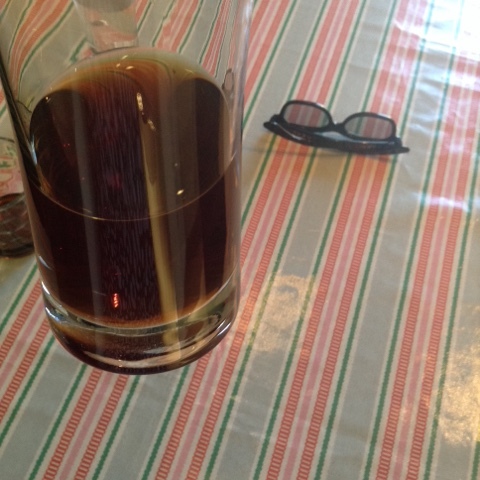 We discussed what colour we thought would be created and T came up with the idea to pour all the colours in one glass which he called 'his cola' because it was the same colour as the cola that we used for the penny experiment. 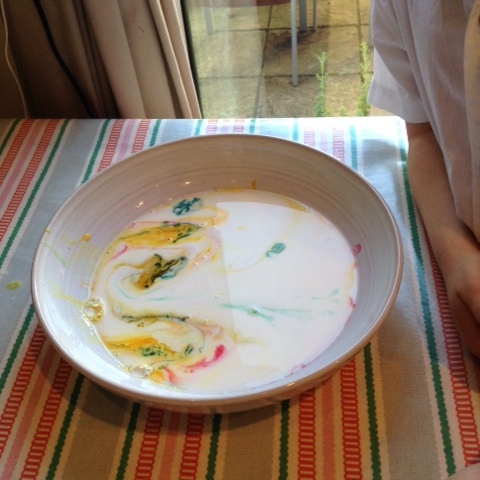 Our last experiment was the swirling colours experiment with milk, food colouring and washing up liquid. 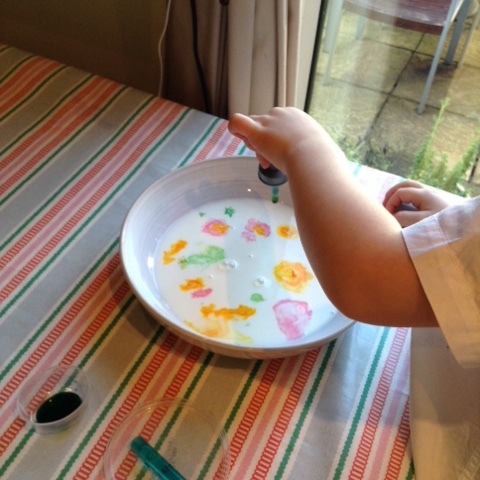 The pictures just don't do it justice, after adding the food colouring, T added a tiny drop of washing up liquid and the coloured swirled around in lovely patterns, he really loved this one! I hope you enjoyed our impromptu mad scientist day as much as we did. You certainly have a scientist in the making there! This is so cool! Will try the dancing raisin experiment with my daughter. We have done the color mixing and milk-color-and dishwashing liquid before. The colors turn out amazing don't they. What a fab day with lots of fun science. Lovely to see him dressed up, getting really involved too. 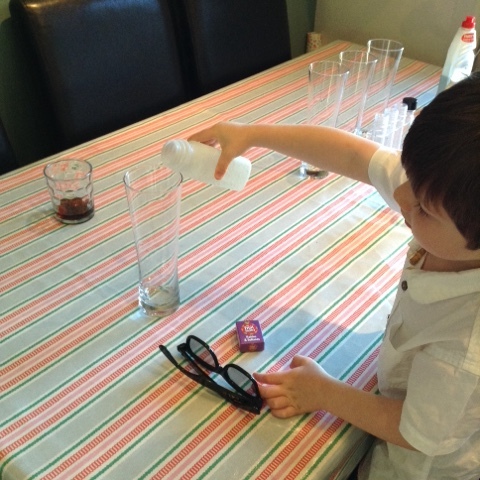 My son loves science experiments too. Love, love, love that you did this for him. I'm sure it will be a day that he remembers always. My son recently asked for a "Harry Potter Day!" Fun times we're had by all. Thanks for sharing at the Let Kids Be Kids Linky.